We inch closer and closer to the premiere of the DC Films universe, and now a German AMC Theaters website may have revealed the running time for Batman v Superman: Dawn of Justice, which hits theaters on March 25, 2016, which has the film running about 2 hours and 30 minutes. So despite us getting 2 and a half hours of goodness in that film, director Zack Snyder revealed today that Justice League Part 1 is set to start filming on April 11, 2016. That means we will get another DC Film universe movie shooting a little over two weeks after the release of Dawn of Justice. Justice League Part 1 will shoot at the Warner Bros. Leavesden studios in southeast England, as well as various locations around London and in Iceland (Sorry, Detroit, as Michigan’s film incentives were less of an attraction this time around). Justice League Part 2 will shoot separately and is on the release schedule for 2019, following standalone movies for The Flash (Ezra Miller) and Aquaman (Jason Momoa) (both planned for 2018). DC Films will continue with the development of Cyborg movie with Ray Fisher, and a new take on Green Lantern, which is currently uncast. Wonder Woman hits theaters on June 23, 2017 with Gal Gadot in the lead. 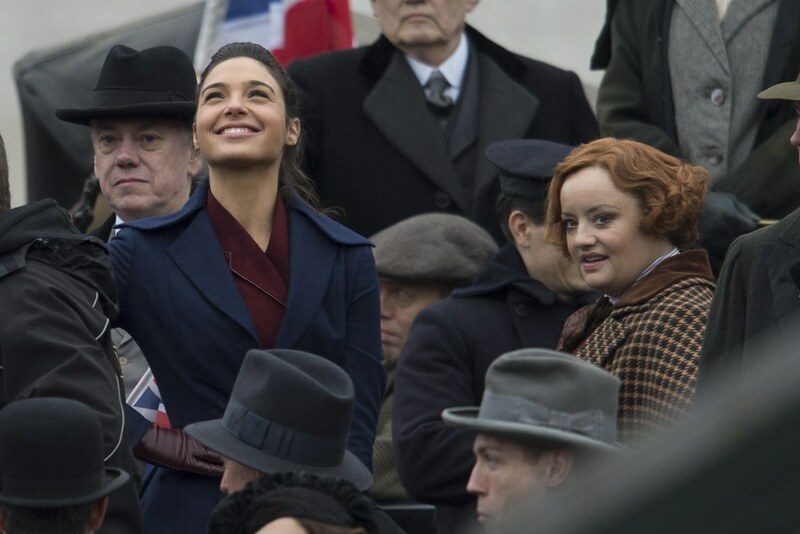 Speaking of Wonder Woman, new behind-the-scenes photos appeared online showing Gadot with her civilian sidekick Etta Candy as portrayed by a portly Lucy Davis (BBC’s The Office). Even more photos from the set show London celebrating the end of World War I from the actual Trafalgar Square. The film is shooting in England at the same studio for Justice League Parts 1 and 2, so Gadot will likely just slide over from one sound stage to another once Part 1 ramps up production on April 11th. Directed by Patty Jenkins, Wonder Woman stars Gadot as Diana Prince, Chris Pine as Captain Steve Trevor, and Davis as Etta Candy, with Connie Nielsen, Robin Wright, Danny Huston, David Thewlis, Ewen Bemner, Saïd Taghmaoui, and Elena Anaya.